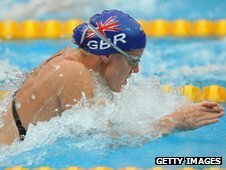 Lincolnshire swimmer Kate Haywood says she can not wait to return to the UK for the Olympic trials in March. The 24-year-old moved to Australia a year ago to train alongside Olympic champion Leisel Jones. Haywood swam at the Beijing Olympics and also won two bronze medals at the 2010 Commonwealth Games in Delhi. She told BBC Lincolnshire: "Training has gone well. I can't wait to come over to the UK in March for the trials. It's going to be so exciting."